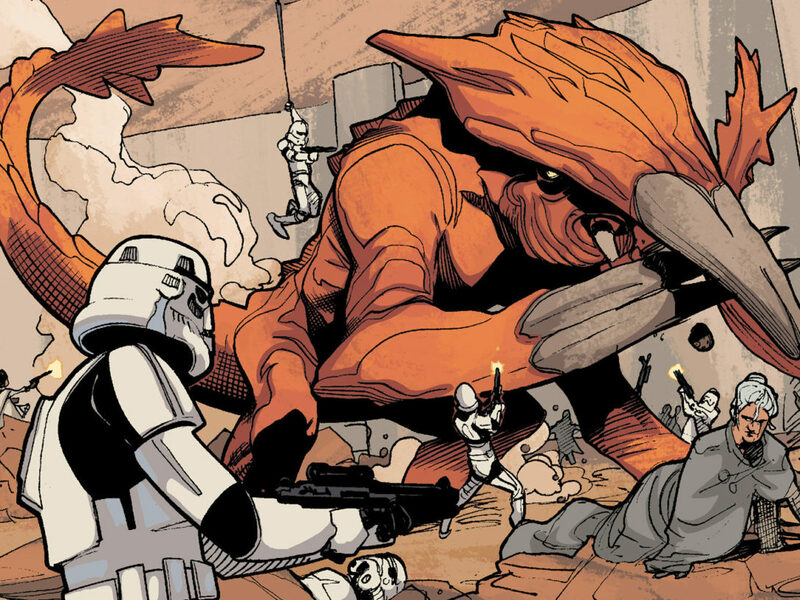 While no man has ever seen a dinosaur from the mesozoic era, other animals from the Star Wars universe are actually very familiar to us. 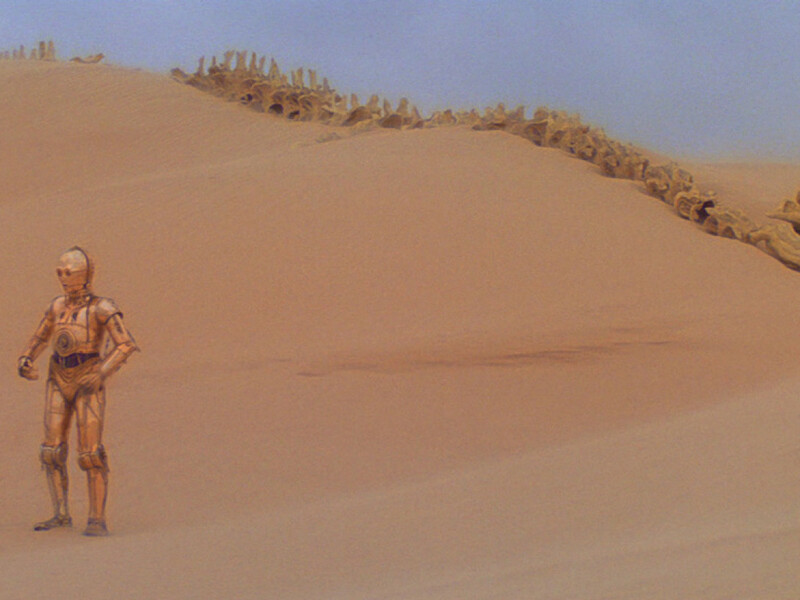 The absence of Earth is an important element in Star Wars‘ status as fantasy and space opera. Jocasta Nu would say: “Earth simply does not exist.” But several elements from our own planet have nevertheless slipped into that galaxy far, far away. Indigenous lifeforms from Earth (humans for example) are one of these elements. Especially some of the early novelizations excel in mentioning familiar animals. In the novelization of A New Hope, ghostwritten by Alan Dean Foster, we already learn that several creatures from Earth are also inhabiting the Star Wars galaxy. The dog is one of them. Foster writes about a scene on Tatooine: “Sandflies buzzed lazily in the cracked eaves of pour stone buildings. A dog barked in the distance…” It turns out that both Luke Skywalker and Lando Calrissian (see Flamewind of Oseon) once owned dogs. The earliest dogs were domesticated by humans around 15,000 BCE and it seems people have been doing the same on Tatooine and on other worlds in the Star Wars galaxy. Also mentioned in the novelization of A New Hope is the duck. Obi-Wan, who has been known to spend some time on Naboo, utters: “Still, even a duck has to be taught to swim.” Luke doesn’t seem to have a clue since he replies, “What’s a duck?” During the Battle of Yavin it is Gold Leader Jon Vander “Dutch” who uses the proverb, “We’re sitting ducks down here.” Next to the sandflies, dog, and the duck the novelization of A New Hope also mentions a panda (“…Threepio might not know a Bantha from a panda.”). James Kahn, the author of the novelization of Return of the Jedi, makes another interesting comparison. This time it’s between the size of the rancor and the size of an elephant. An elephant is mentioned as well in Lando Calrissian and the Mindharp of Sharu. Lucasfilm probably didn’t care about pandas and dogs appearing in the early novelizations or spinoff novels. They had more urgent matters to attend to and some common animals also appeared in the movies. And didn’t the ship that made the Kessel Run in less than 12 parsecs get part of her name from a certain bird of prey from Earth? Now, let’s have a look at the animals from Earth that can be seen and heard in the movies or television spinoffs. The crew of The Empire Strikes Back searched our entire planet for a suitable location to shoot the bogworld until they decided to build it at Elstree Studios. 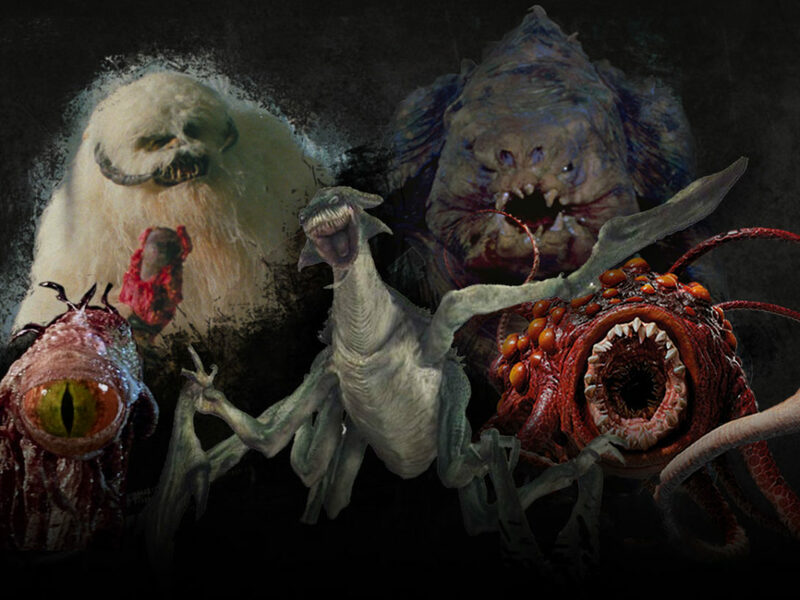 Instead of creating a lot of strange creatures on Dagobah, they used living animals from Earth (a lot of unused concepts ended up in The Illustrated Star Wars Universe and in The Wildlife of Star Wars). The set of Dagobah was so huge that it became a miniature ecosystem on its own. After a while birds, insects, and spiders began to live in the giant would-be swamp. A water monitor was used to impersonate the sleen and a lizard was used for the nudj. Several South American king snakes crawled around Yoda’s hut and even in Luke Skywalker’s X-wing when he was about to leave Dagobah. Mark Hamill apparently got bitten by the snake hiding in his starfighter. 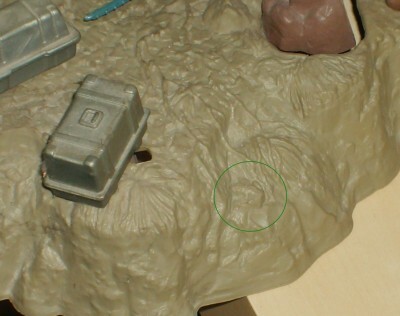 Another lizard (probably an iguana) can be seen crawling on a fossil when Luke is witnessing Yoda pulling his X-Wing from the swamp. Responsible for the animals on Dagobah was handler Mike Culling. He reassured Hamill that the snakes made excellent pets. His company, Animal Actors, provided an African boa constrictor named Basel and a python named Peter. Culling remembered showing Irvin Kershner a lot of his exotic creatures, such as bats, spiders, rats, scorpions, and giant toads to make a possible appearance in the swamps of Dagobah. According to A Journal of the Making of The Empire Strikes Back the production did use some of the giant toads, although they can’t be seen in the movie (you can spot one on the vintage Kenner Dagobah playset, if you look carefully). 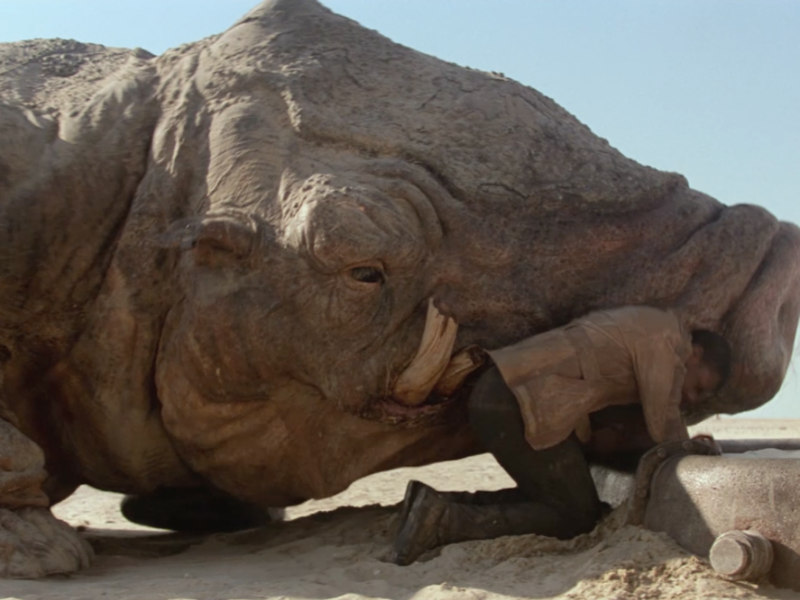 Jabba’s Palace on Tatooine was visited by the strangest species from around the galaxy. But its dungeons were perfect to house one of Earths most infamous rodents: the rat. 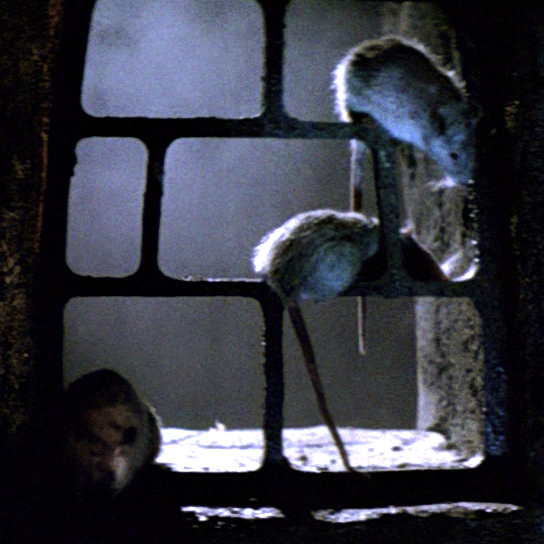 When C-3PO was forced to venture through the dungeons in 4 ABY, he encountered some big rats. When Boushh arrives to collect the bounty on Chewbacca, have a close look at Jabba’s foodbowl. You can see a large frog (a Klatooine paddy frog in the Star Wars universe) swimming in the bowl. Toby Philpott, one of Jabba the Hutt’s main puppeteers, still remembers a few things about the animal used in the bowl. “It was an exotic giant from the zoo, possibly African,” he says. “I think it was a toad (but I am not sure). It had a handler. The one Jabba eats is rubber, of course. And the real one did jump out once, because we could hear the panic, but Dave [Barclay] and I and could see nothing…The few call sheets I have say “Animals: frogs, etc.,” but I have no idea who would know for sure. They were only on set for certain shots, and we were inside Jabba, not interacting with them at all.” Maybe The Making of Return of the Jedi‘ will reveal the truth about Jabba’s favored snack in October. One cool animal from Earth is Chief Chirpa’s iguana (in-universe name still unknown). The novelization mentions that this reptile is not only Chirpa’s pet, but also his advisor. It is unknown whether the advice went further than the taste of delicious plants and leaves (the iguana is a herbivore). 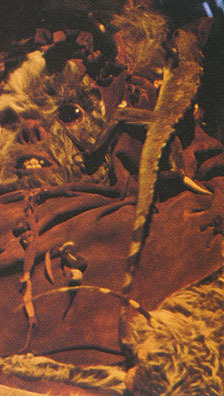 You can see the iguana crawling on Chirpa’s abdomen during C-3PO’s tale of the Galactic Civil War in the Chief’s hut. Maybe the iguana agreed to join the Rebel Alliance as well. In some mythologies ravens are mediators between live and death, while in others they’re carriers of information and wisdom. Ravens also exist in the Star Wars universe. The rogue Nightsister Charal (Battle for Endor) was known to metamorphose into a raven with the Talisman of the Raven, a ring she stole on Dathomir. 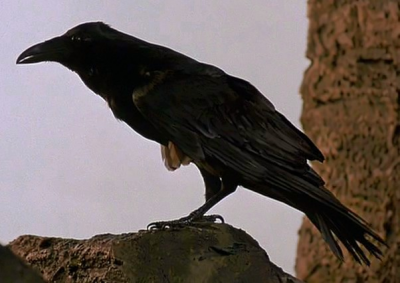 Eventually the Talisman was destroyed and Charal was doomed to remain a raven. 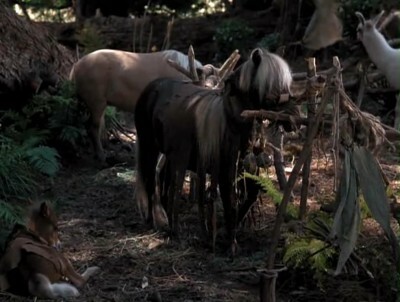 The yard of the Warrick family on Endor is the place to be for Earth animals. It even looks a bit like a petting zoo. 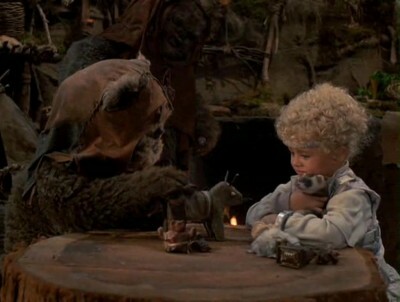 When the Towani family crashed on Endor, the family was able to meet a hamster, a rabbit, llamas, and a ferret. 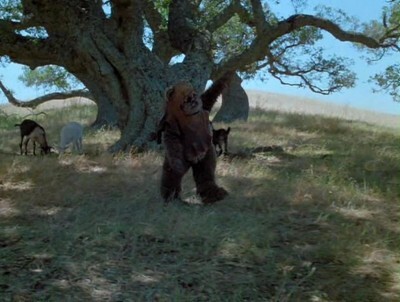 The tip-yip (chicken), guapa (pony) and pulga (horse) also seem very familiar, but at least their Ewok name is known. When Wicket thinks that a pulga is the same as a starcruiser, Cindel replies: “Horses don’t fly.” Guapas and pulgas should not be confused with bordoks. In Caravan of Courage we can also see an owl in Logray’s hut and some goats looking high on a hill for a lonely Ewok goatherd. Some animals from Earth don’t just appear in the movies, they’re (also) mentioned in proverbs. Captain Panaka feared to become “sitting ducks” when the deflector shields of the Royal Starship were gone during the Invasion of Naboo in 32 BBY. Living alongside the Pelikki, the duck was a waterfowl native to Naboo. The Dusty Duck was a derelict Pa’lowick designed light freighter stranded in Mos Espa and the source of more than one local ghost story. When C-3PO was drafted unexpectedly into service as a B1 Battle Droid on Geonosis, his Vocabulator uttered the phrase: “Die, Jedi dogs!” He immediately felt ashamed for his confusion. So, Tim has established that there’s an entire menagerie of Earth originated animals in the Star Wars universe, across novelizations, TV movies, and saga episodes. But our ark of animals isn’t limited to their visual on-screen appearances. A huge number of alien creatures were “voiced” by common Earth animals, some more familiar than you’d think. Back in 1976, when gathering sounds to build the audio library for Star Wars, Ben Burtt amassed a hefty catalog of animal sounds, all with the intention of bringing the alien races of Star Wars to life, but giving us viewers recognizable touchstones to help better articulate the creatures to the audience. The most classic and well-known example of this is Chewbacca, the lead alien character in the classic trilogy. His vocabulary was brought to life by a mixture of a cinnamon bear named (what else) Pooh, a black bear named Tarik, lions, seals, sea lions and Petulia, a walrus Burtt recorded at a zoo. Throw in a dash of Burtt’s genius, Peter Mayhew’s iconic walk and an amazing yak hair Stuart Freeborn-suit and you have Han Solo’s arm-ripping co-pilot. 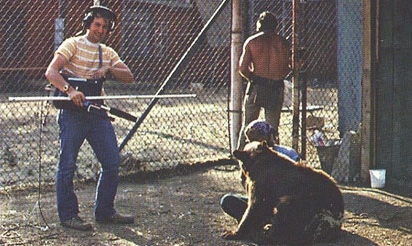 Many fans will know that the Bantha was portrayed by a female Indian elephant named Mardji, but perhaps they won’t know that the bantha sound was in fact a slowed down bear roar. Or that their masters, the Tusken Raiders, were voiced by Tunisian mules barking and echoing off canyon walls. Entering that wretched hive of scum and villainy that was the cantina we learn that Ponda Baba was actually voiced by a walrus (although we can’t confirm if it was Petulia) and that the hum of laughter in the room was the cackle of a hyena. How appropriate. Not much need for animal sounds on the Death Star, but it’s worth noting the presence of a tiger roar in the TIE Fighter engine sound and human screams augmenting the destruction of Alderaan. On Yavin 4 we hear the cries of exotic birds, voiced by…well, birds. Beyond the original film, in the much-loved Holiday Special of November 1978 we hear many more Wookiees on Kashyyyk that were voiced by camels and a mixture of bears, lions, and cougars (of the feline kind, we have no evidence that Diahann Carroll voiced any characters other than her own) that fill out the gathering of alien creatures at Ackmena’s cantina. Moving on to The Empire Strikes Back the very first alien creature we encounter is the tauntaun and its unusual nattering was provided by a sea lion with the very cool sounding name of Mota. And the recordings of a sea lion mixed with the bass rumble of an elephant combined to give life to the roar of the wampa ice creature. Empire contains the smallest amount of alien characters in a Star Wars movie so far and so moving on to Bespin and the city in the clouds we encounter the Ugnaughts, who are voiced by arctic fox pups and their mother. A far cuter sound than the actual Ugnaught itself, which possessed a face only a mother could love. 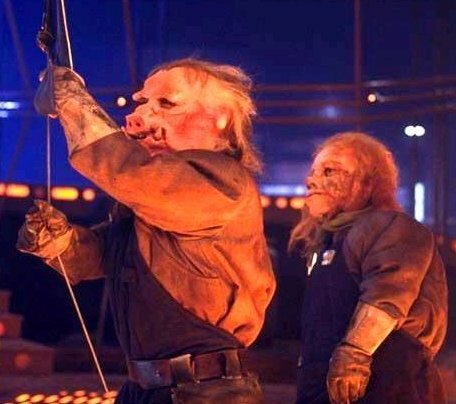 Moving ahead and onto Return of the Jedi we stay with the porcine theme and learn that the guttural grunts of Gamorrean Guards were in fact…pigs. Yes, no surprises there, but you may be intrigued to learn that the roars and screams of the fearsome rancor were a remixed recording of an aggressive dachshund, which inadvertently brings to mind ill-tempered mutated sea bass. The Sarlacc included recordings of a crew members stomach after eating pizza and the hiss of alligators, all blended to show the constant hunger of the creature that inhabited the Pit of Carcoon, and the remainder of Jedi featured familiar sounds and human voiced Ewoks. Stepping back three decades to the time of The Phantom Menace the flightless reptavian Kaadu from the swamps of Naboo were a concoction of slowed down pigs and the blowhole of a whale. The Geonosians of Attack of the Clones were a deftly mixed brew of flying foxes and the mating cry of penguins recorded in Australia, while the terrifying acklay of the Geonosian arena was a mix of dolphin and pig. Boga, Obi-Wan’s mount in Revenge of the Sith, was a mixture of dogs, a coyote from Skywalker Sound’s vast library, and a Tasmanian devil originally recorded for Willow, showing that nothing gets wasted and every sound can have a purpose. Or should that be porpoise? In the first season of The Clone Wars we encounter Gor, Grievous’ pet roggwart. Gor’s sound was based on a lion and a vulture. The gundark-sound in the series was a mixture of a horse and a shrieking parrot. 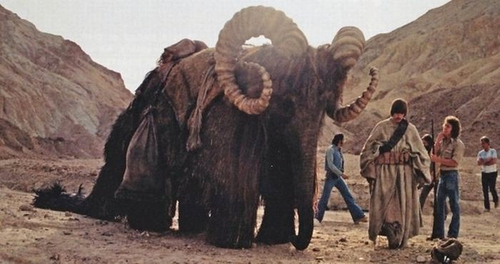 And now as we wait for Episode VII we have to wonder what Earth animals will make an appearance in the new films. I’m hoping for an irritated sloth, a disinterested giraffe, and perhaps a furious pigmy marmoset. Here’s hoping the wizards at Skywalker Sound are up to the challenge. Mark Newbold has been running websites since 1995 and today co-owns/content manages the largest English speaking Star Wars fan site in Europe, Jedi News. He has been a contributor to Star Wars Insider since 2006.